Holiday.gr - Kassiopi, a trip to a myth! In north Corfu, 37km from the city we meet Kassiopi. 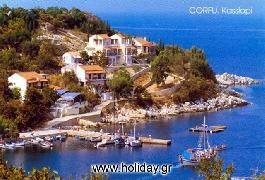 It is the domicile of the homonym municipality and the biggest village in north Corfu. Until recently Kassiopi was known as graphic fish village with a beautiful beach. But in the last years it is developing with exponential rhythms in a modern tourist resort. There are many hotels and rooms to let in Kassiopi that offer all sort of comforts. Kassiopi also has a lot of bars and clubs that attract young people and make it a cosmopolitan summer resort. The beach of Kassiopi and the, awarded with the Blue Flag, beach of Klamiona distinguish for their good organization. There, you have the opportunity to try water sports. The region apart from a vivid nonce, has a rich historic past. It flourished during Roman times and according to the tradition the emperor Neron visited it. Among historic monuments distinguish the remains of the castle built during the period of Andigavnon dominance(1267-1836)which was considered one of the most strong castles of the corfiat countryside. One of the most important religious monuments of Corfu is the church of Panagia Kassiopitra said to be built on the remains of the old temple of Kassiopos Zeus. The church was built during the first years of Christianity, was ruined by Turkish and rebuilt by Venetian. Been to Kassiopi ? Share your experiences!